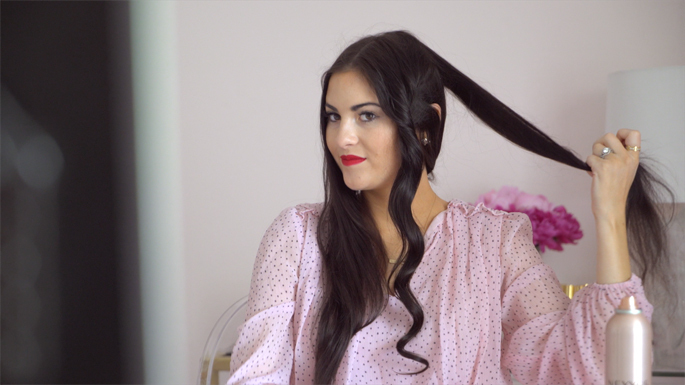 I love seeing bloggers do their hair tutorials…this is so fun! Your hair always looks so amazing! What size dress are you wearing? I am 5 months pregnant and wearing small in maternity clothes, but my bra size is 36DD. Your waves are always perfect! Definitely worth checking out! Loving a wand these days too, so much fun! Love those soft waves! Can’t wait to tune into your segment. I always wear my hair straight, mainly because I can never get my hair to hold a curl! I’d love to know tips and the best products for getting the curl to last all day. Hi Allyson! Thanks so much and I hope it really helps you! Let me know how it turns out!! 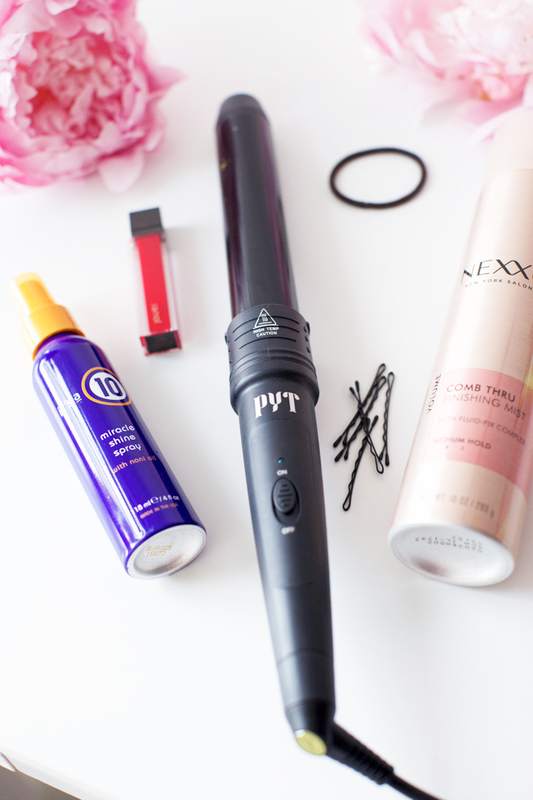 You always have the perfect soft waves! Love this! Your hair always look amazing. 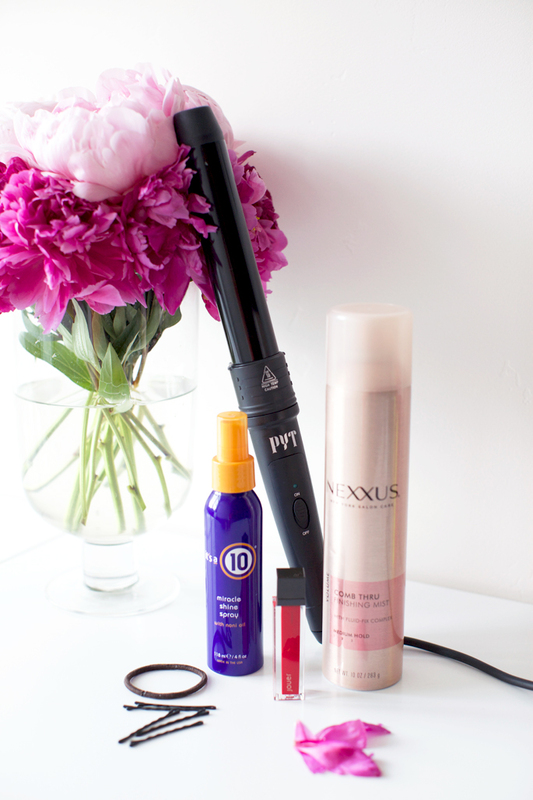 I love curling wands, they are so versatile for curls! Your hair looks amazing! and your dress is gorgeous!! I love It’s a 10 products! I use their leave-in conditioner on a daily basis. Might have to give the shine spray a try too! I know Jamie! I literally cant live without it! I love mine so much!! Love you, Rach! You’re so cute! Not sure I’ll be free to catch the live streaming. But if the video is saved, I’ll be sure to go back to check the link and take a look! Your hair is gorgeous!! This dress is everything! I love!!! P.S. gonna try to curl my hair this weekend! Love your hair! Dress is beautiful!! You look stunning as always. I am 30 weeks pregnant, so I’m right there with ya. This dress would be beautiful for my girl’s baby shower, except that it’s long sleeved. The shower is in July in Mississippi. What are some stores/brands I should look for maternity dresses for baby shower? oh gosh – this first picture is so cute – you look soo happy!! Your soft waves are lovely. My hair is naturally very strait and nearly impossible to curl- even to wave. I have wave/curl envy right now. Thanks for sharing. Hi Zeynep!! I don’t have hair extensions in!! Yes this is natural color but i do get shine treatments on it! Ask your hair stylist about them!! Thanks for sharing the products you use! I wasn’t able to watch the streaming video online, unfortunately. Do you know if they’ll be posting it somewhere again? Or will you be sharing the video on your blog soon? I’d love to see it! Yes Annie you can check out out here http://amzn.to/1S6dBx0 Hope you love it!! !